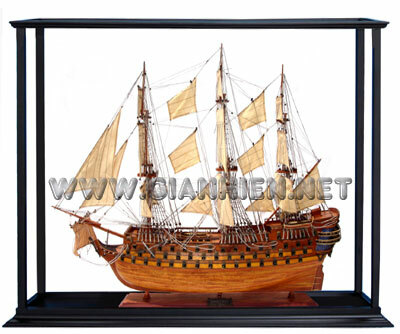 Our model is hand-crafted from hard wood with planks on frame construction and lacquered. Model is fully assembled and ready for display. The Charles W. Morgan is the last surviving wooden whaling ship from the great days of sail. 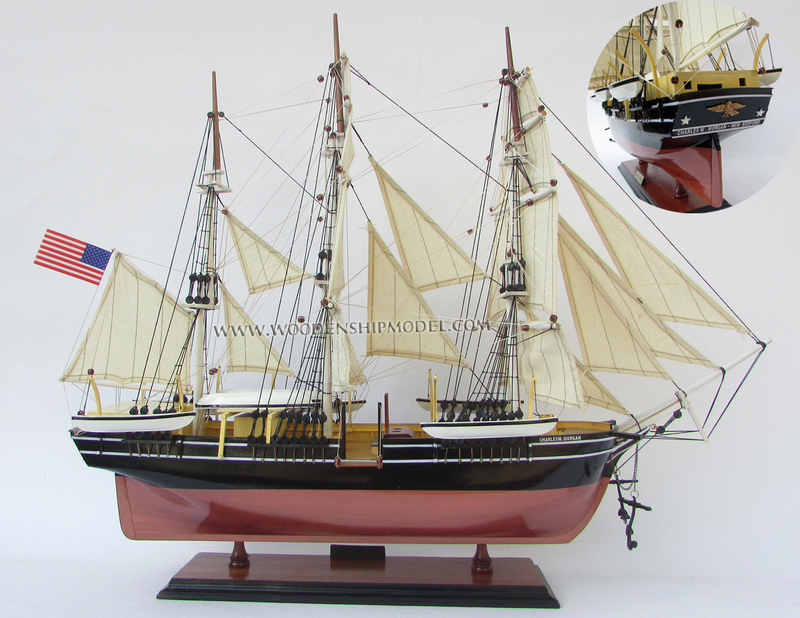 Built in 1841 in New Bedford, Massachusetts, the Morgan had a successful 80-year whaling career. She made 37 voyages before retiring in 1921, and was preserved as an exhibit through the efforts of a number of dedicated citizens. 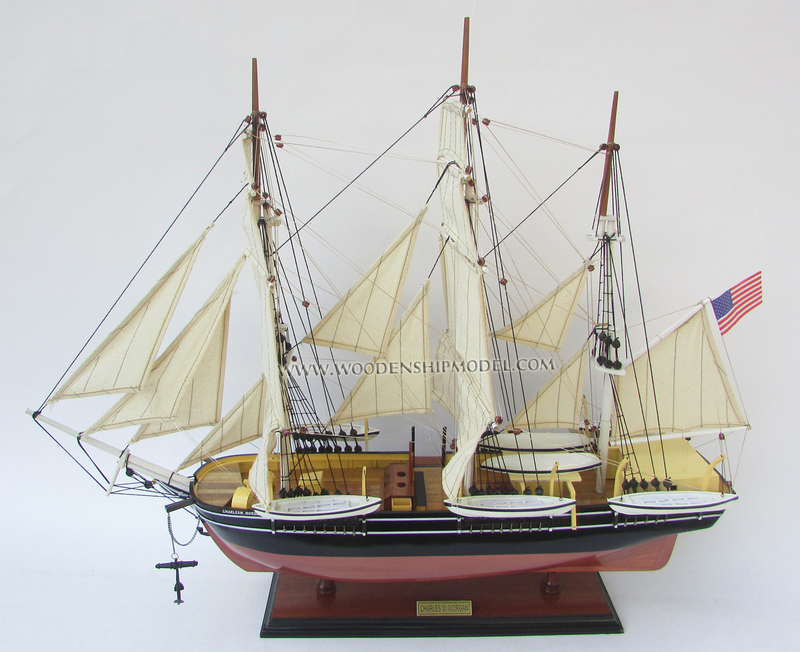 After being on display in South Dartmouth, Mass., until 1941, she came to Mystic Seaport, where each year thousands of visitors walk her decks and hear the fascinating story of her career as a whaling vessel, historic exhibit, film and media star, and a porthole into America's rich history. Take your own journey into the history of this remarkable survivor. 1. Why is the Morgan important? The Charles W. Morgan is the only remaining American wooden whaling ship. 2. Where was the Morgan built? 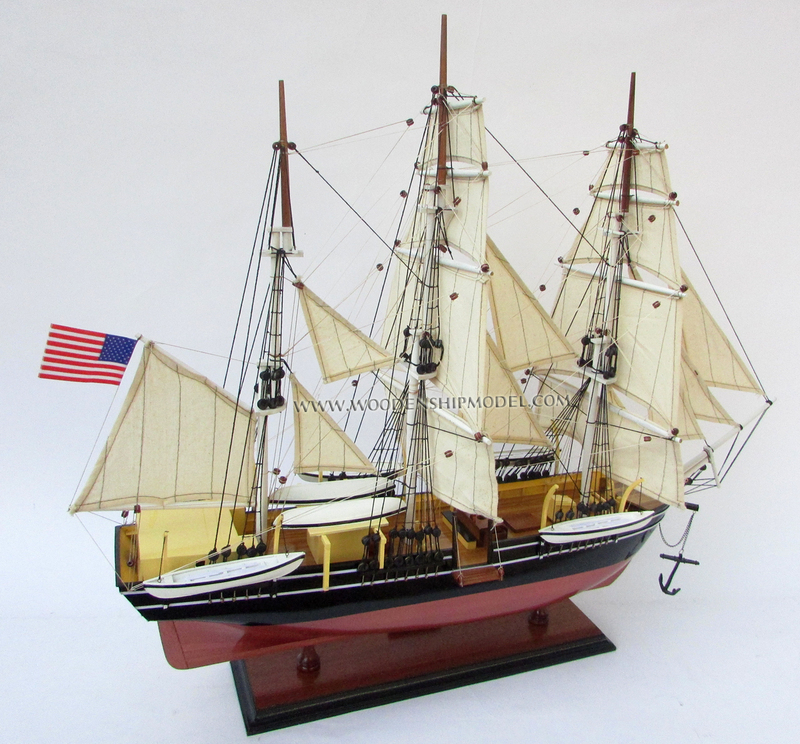 The ship was built at the Hillman shipyard in New Bedford, Mass. 3. How old is the Morgan? 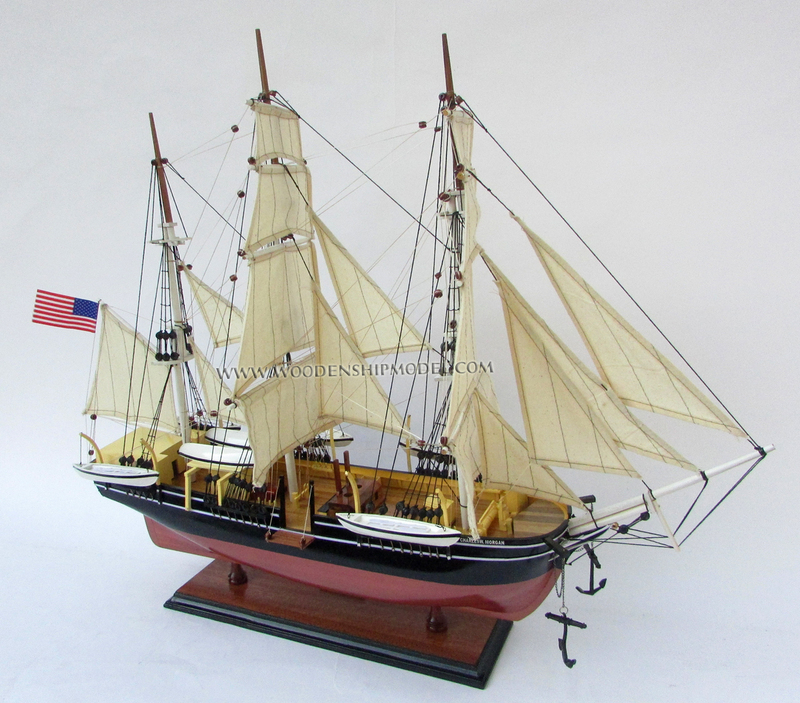 The Morgan was launched on July 21, 1841. 4. How long did it take to build the Morgan? The Morgan was built over a nine month period. 5. How much did it cost to build her? The ship itself cost $26,877, with another $25,977 to outfit her with all necessary equipment and supplies for her first voyage. 6. Who was Charles W. Morgan? Charles Waln Morgan was one of six children born to Quaker parents in Philadelphia. He was born on September 14, 1796. 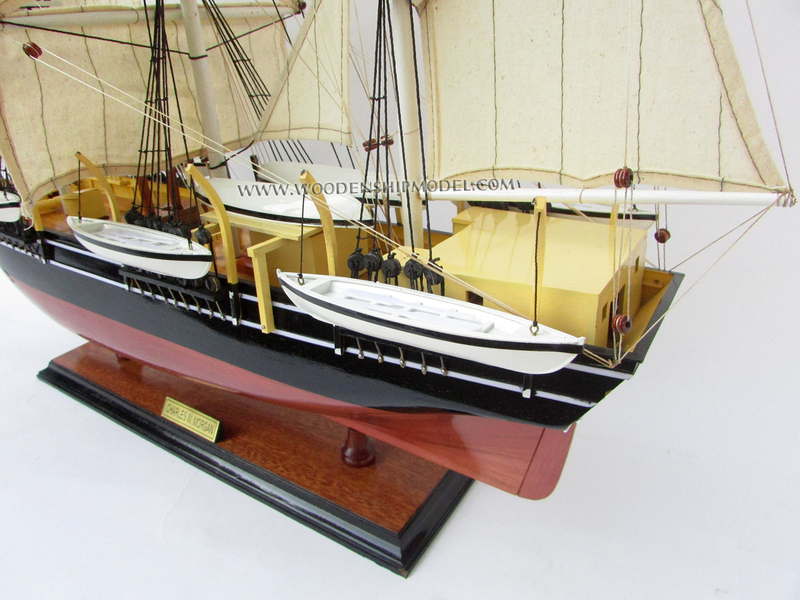 He relocated to New Bedford, Mass., in 1819 where he married Sarah Rodman and began investing in whaling vessels. Morgan managed 15 vessels and owned shares in 18 others during his career. With his whaling profits, he invested in many other business enterprises. Morgan left the Quaker faith to become a Unitarian and was recognized as an abolitionist and a supporter of the temperance movement. 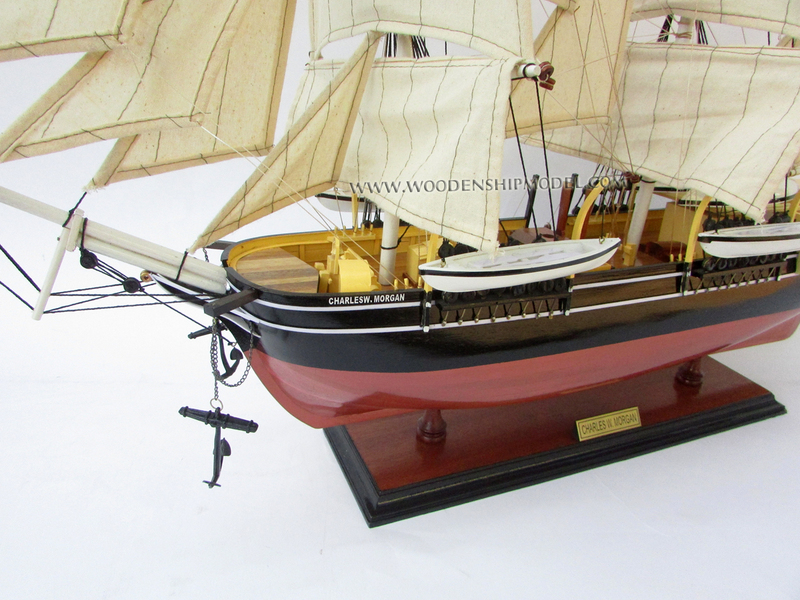 While he was away on business in 1841, Morgan�s nephew took the liberty of naming the new whaling ship after his uncle. Morgan died on April 7, 1861. 7. How big is the ship? The Morgan is comparable to many whaling ships of the time: 105' on deck, 133' overall. Her beam (width) is 27.7' and her draft (depth) is 12.6 feet, although fully loaded she could draw as much as 17.6', her registered depth. Her displacement (weight) is 313.75 tons. 8. How long were the voyages? Her longest voyage was four years and eleven months, while her shortest was "only" eight and a half months. 9. How many in the crew? The Morgan's full crew complement was around 35 men. 10. Where was her home? 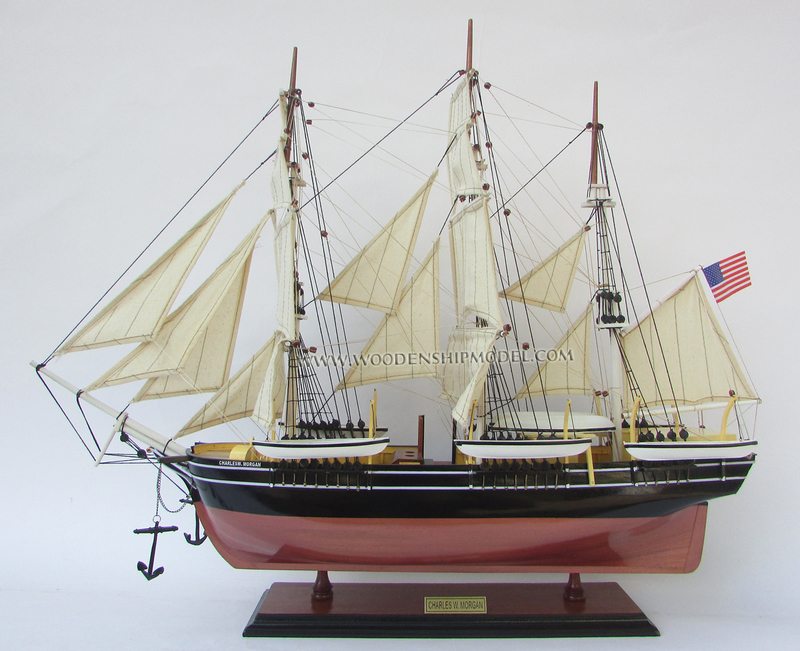 The Morgan sailed from New Bedford, Mass., from 1841 to 1886. Then, as the whaling industry waned, she relocated to San Francisco from 1887 until 1906, off-loading her whale oil and shipping it back east by rail. The Morgan returned to New Bedford between 1906 and 1921, when she �retired� from whaling. 11. How many trips did she make? 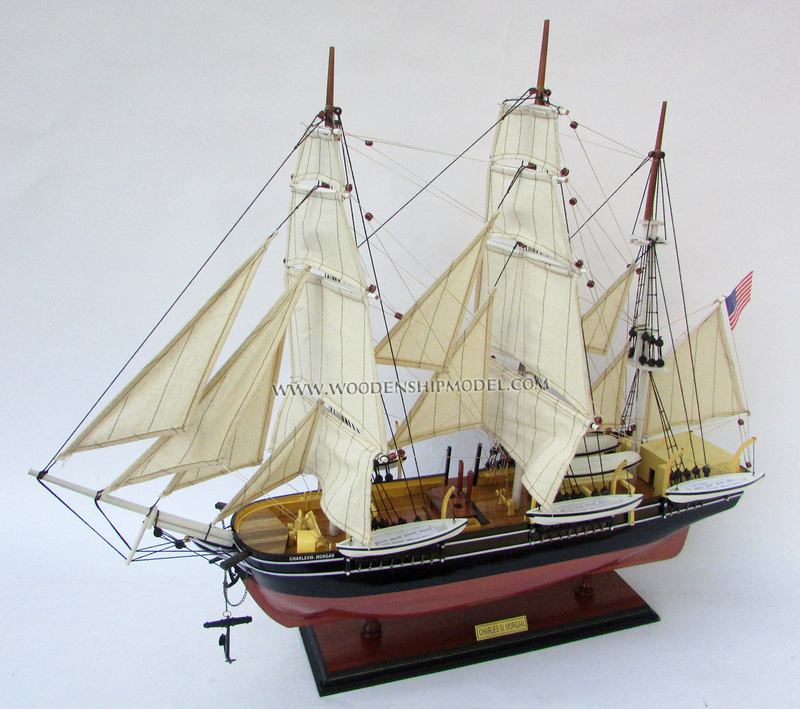 The Morgan made 37 whaling voyages under the command of 20 different captains. 12. How much money did the Morgan make? The Morgan�s career was a profitable one. During her 80-year career, oil prices varied widely; but by the time she stopped whaling, the Morgan had earned a total of more than one million dollars. Her best voyage brought in $165,405, and her least, $8,977. 13. Were there women aboard? Five captains� wives sailed with their husbands on the Morgan. The captain was the only one permitted to bring his wife and family members aboard the vessel. 14. Why did they hunt for whales? Before petroleum oil was discovered in 1859, whale oil was a primary agent for lubrication and illumination. Even after the discovery of petroleum, whale oil was still used for many applications. In addition, other important products, including baleen (a plastic-like material), spermaceti (a waxy substance used to make candles) and ambergris were harvested from various species of whale. 15. Which kinds of whale did they hunt for? Vessels like the Morgan primarily hunted three species of whale: sperm, right and bowhead. These species were easy to catch (relative to other species), yielded the most desirable products and reliably remained afloat when they were killed. Occasionally other species, including the California gray whale, were also pursued. 16. How did they catch the whales? When whales were spotted from the lookout hoops of the ship, the officer-in-charge determined how many boats to send in pursuit. For most of her career, the Morgan carried five whaleboats. Six crew members manned each boat, which was then rowed, sailed or paddled (depending on conditions) to the whale(s). A harpoon, with a long line attached, was thrust into the whale, securing the boat to the whale. Frequently, the whale would swim away until it grew weary from pulling the boat over the sea. When the whale stopped to rest, the crew would bring the boat close to the whale and kill it with a long lance or heavy firearm. 17. How would they process the whale? Once along side the ship, the dead whale would be secured and the insulating layer of blubber just below the skin would be removed, cut into manageable pieces and melted into oil in the kettles of the try-works on board. The oil would then be stored in casks and barrels below deck. The head of the whale was removed and various products (including baleen and spermaceti) were harvested and stored. 18. How much whale oil could the Morgan hold? The Morgan�s cargo capacity was around 3,000 barrels (each barrel held 31.5 gallons). Therefore, the Morgan could potentially bring home over 90,000 gallons of oil. At times, whaling was very dangerous. Numerous accidents occurred while working aloft in the rigging, processing the whales or during rough seas. The hunt and chase involved close encounters with a very large and potentially aggressive creature. Whaleboats were sometimes tipped over or smashed by whales, and men were injured or killed as a result. However, compared with other seafaring trades, whaling was not terribly dangerous. Men working in the commercial fishing trade were far more likely to be injured or killed than whale men. 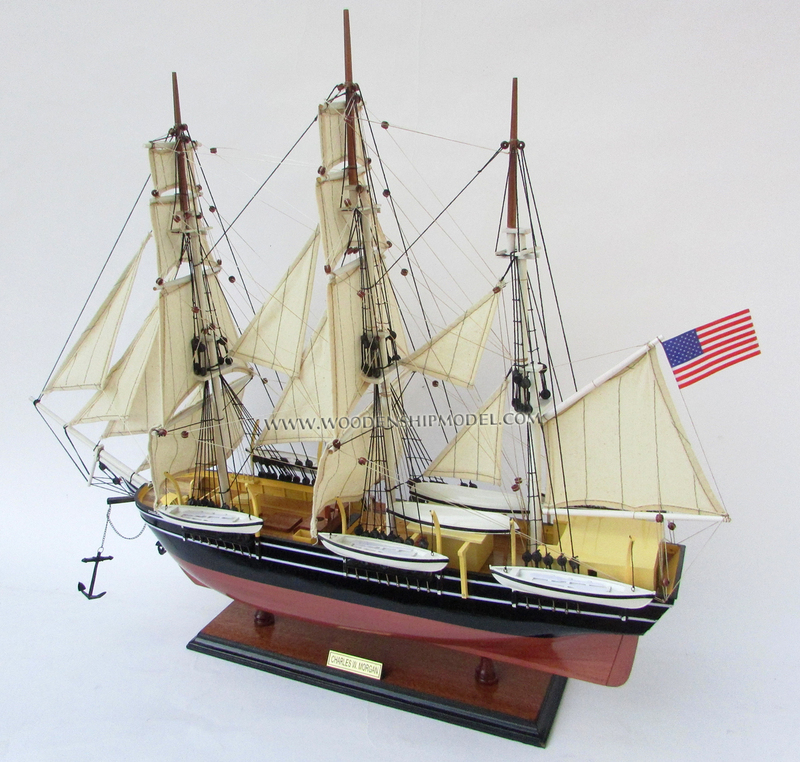 Charles W. Morgan made 37 voyages in her 80 years of service from her home port of New Bedford, Massachusetts, ranging in length from nine months to five years. She brought home a total of 54,483 barrels of sperm whale oil and 152,934 pounds of whalebone. She sailed in the Indian and South Atlantic Oceans, surviving ice and snow storms. Her crew survived a cannibal attack in the South Pacific. She was based in San Francisco between 1888 and 1904. Charles W. Morgan had more than 1,000 whalemen of all races and nationalities in her lifetime. Her crew included sailors from Cape Verde, New Zealand, the Seychelles, Guadeloupe, and Norfolk Island. The ship's crew averaged around 33 men per voyage. As with other whaleships in the 19th century, Charles W. Morgan was often home to the captain's family. She was owned and managed by the J. & W. R. Wing Company of New Bedford. During her years of service, Charles W. Morgan was used in several movies, including Miss Petticoats (1916), Down to the Sea in Ships (1922) and Java Head (1923). Charles W. Morgan was nearly destroyed in 1924 when the steamer Sankaty caught fire and broke free of her mooring lines. The burning Sankaty drifted across the river and into Morgan's port quarter, but the Fairhaven firemen managed to save the Morgan. This event spurred Harry Neyland and some New Bedford citizens to restore and preserve the Morgan, but the attempts was unsuccessful in their efforts. Neyland then persuaded Colonel Edward Howland Robinson Green to save the ship. Neyland appealed to Green that the Morgan was of historicial importance and was a family heirloom because she was once co-owned by Green's grandfather and his wife's company. Green had the ship towed to his estate in Round Hill (Dartmouth, Massachusetts) and founded Whaling Enshrined, consisting of himself, Neyland, and John Bullard, the great-grandson of Charles Waln Morgan. 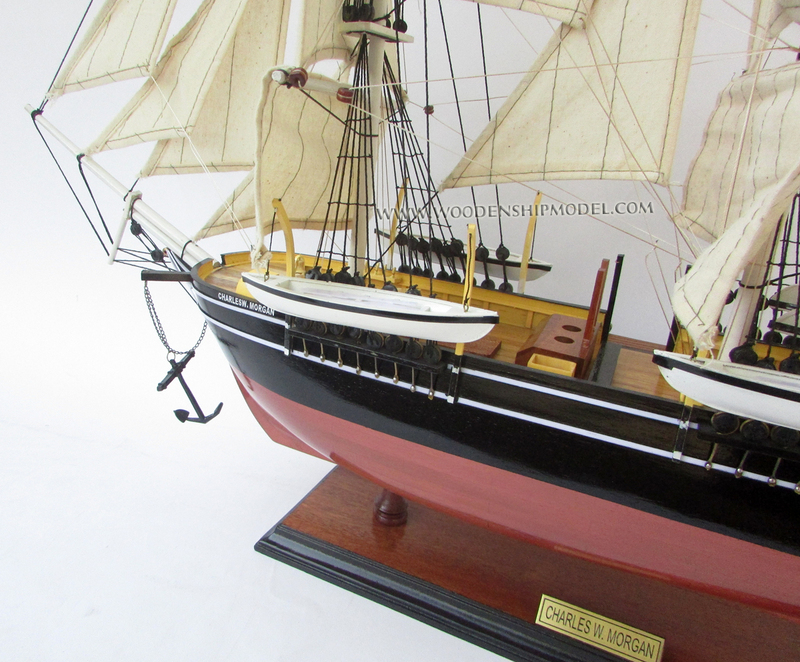 Charles W. Morgan underwent restoration by Captain George Fred Tilton and was turned into an exhibition for Green's estate in a berth constructed by Frank Taylor. Green held a dedication ceremony on the 86th anniversary of the ship's launch and gave it to Whaling Enshrined on July 21, 1926. The ship's fate came into question when Tilton died in 1932 and Green died in 1935, resulting in lengthy court proceedings over Green's estate. 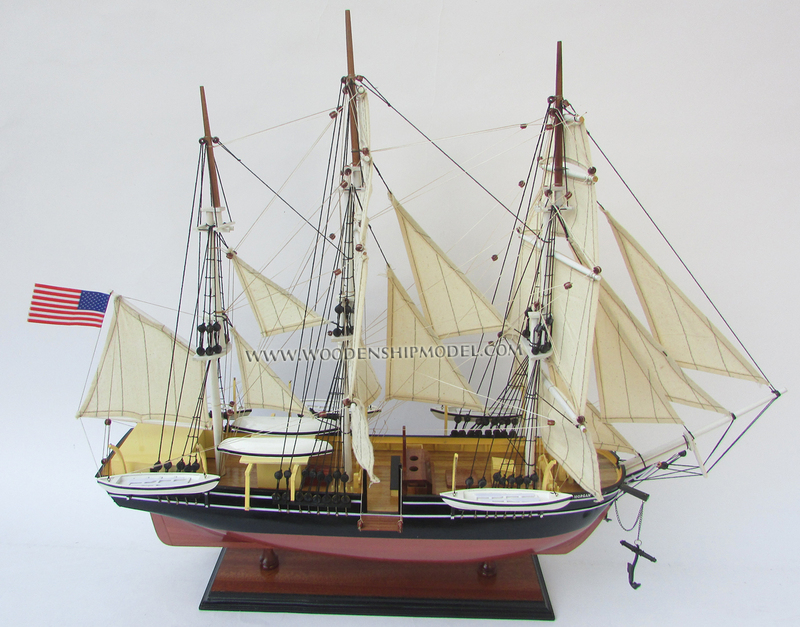 The 1938 New England hurricane damaged Morgan's hull and tore the sails; Whaling Enshrined attempted to secure funds for the ship but were unable to do so. In 1941, Charles W. Morgan was saved by the Marine Historical Association (later renamed Mystic Seaport) based on Taylor's word that the ship could be freed and towed to Mystic, Connecticut. Taylor's crew dug Morgan from her berth and dredged a channel for her to pass through, but the first attempt to pull the ship free was unsuccessful. More digging and caulking of the ship preceded the Morgan's successful tugging into the channel, and the century-old hull withstood the move and floated into bay with assistance from the Coast Guard cutter General Greene. She was towed to the old berth in Fairhaven for several days of preparations and repairs prior to the trip to Mystic. On November 5, 1941, General Greene pulled Morgan from the wharf only to have her be caught by the tide and swept downstream, coming to rest on a mud flat and requiring two hours to be freed. :4 The journey came to an end on November 8 when she passed through the Mystic bridge and was moored in the Mystic Seaport. The Mystic Seaport took shape around Charles W. Morgan with the restoration of its buildings and historic ships that came to reside at the museum. "Over it all, the Morgan presided like Old Neptune-the centerpiece, the king seated on a throne of gravel, towering high above the scene. Charles W. Morgan arrived at Mystic Seaport in December 1941. The ship was declared a National Historic Landmark and listed on the National Register of Historic Places in 1966. In 1971, Melbourne Brindle of Bridgeport, Connecticut designed four commemorative stamps of historic landmarks including the Morgan. 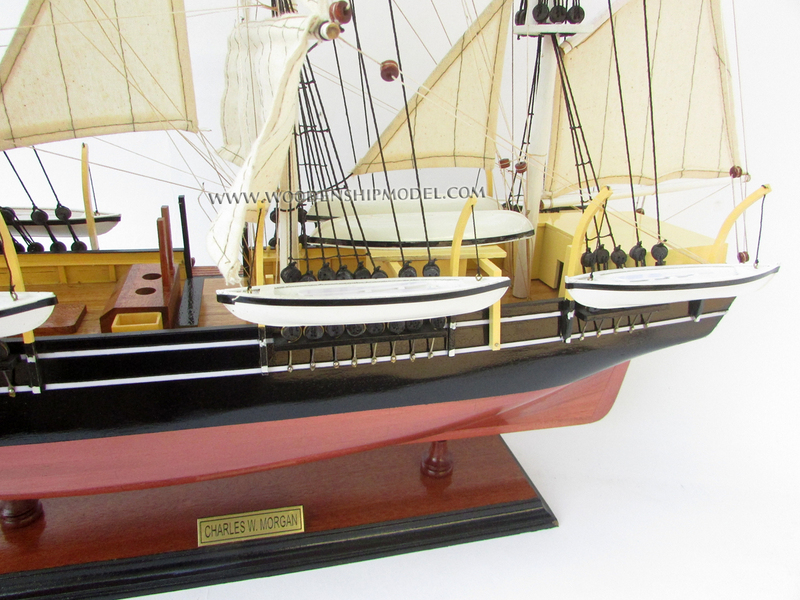 For the first 30 years at Mystic Seaport, she was surrounded by a bed of sand to prevent her from sinking. Even so, she was open to the public and was the centerpiece of a recreated 19th Century maritime village museum inspired by Colonial Williamsburg. She is the only preserved 19th Century whaling ship in the world. The Mystic Seaport undertook a restoration and preservation project in 1968 to make her seaworthy, and the sand bed was removed. Prior to the 1968 restoration, she had a wide white stripe painted on her sides with large black squares that resembled gun ports when viewed at a distance. This "camouflage" was often employed by 19th Century merchant ships to make them resemble warships so as to deter pirates and hostile navies. In 2010, Mystic Seaport engaged in a multimillion-dollar project to restore the ship to seaworthy status. She was re-launched into the Mystic River on July 21, 2013, marking the 172nd anniversary of the vessel�s initial launch. 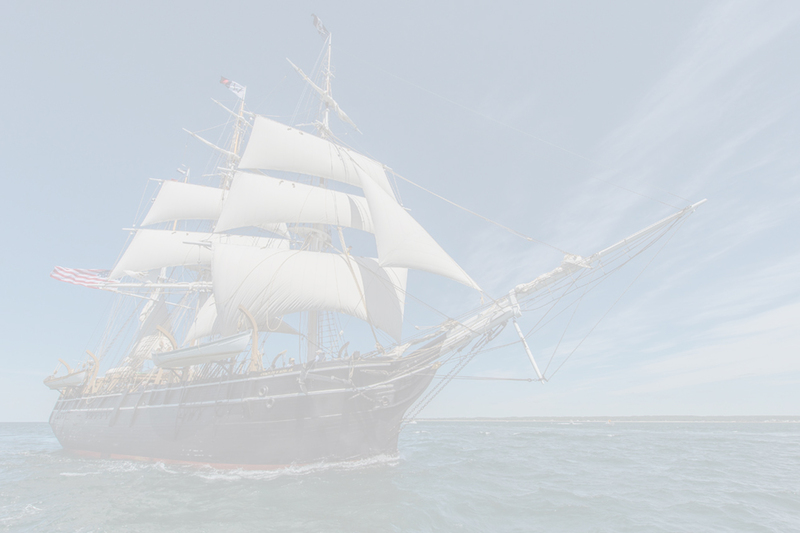 During the summer of 2014, she sailed her 38th voyage on tour of New England seaports which included New London, Connecticut, Newport, Rhode Island, Boston, and her home town of New Bedford, Massachusetts.